2016 • VDMA MINING SUPPLEMENT VDMA 21 As mining operations develop, the underground workings extend farther from the shaft or portal and become more complex as they continue to expand. Travel distances and times increase, which also complicates rescue efforts. "Safety is one of our core values. It drives everything within our business. As a result, alternative methods of performing a mine res- cue needed to be considered," said Markus Uchtenhagen, mine rescue project manager for Goldcorp, one of the world's leading gold producers. "Current breathing apparatus' durations and physical human limitations do not allow for these increased work time required to respond to some of the farthest reaches of our operations." To extend the useable work time of the current breathing apparatus, a mine rescue vehicle, the MRV 9000, was developed in cooperation with Dr . This vehicle allows rescuers to travel in a contaminated environment, while still maintaining full use of their breathing apparatus capacity for on-site missions. 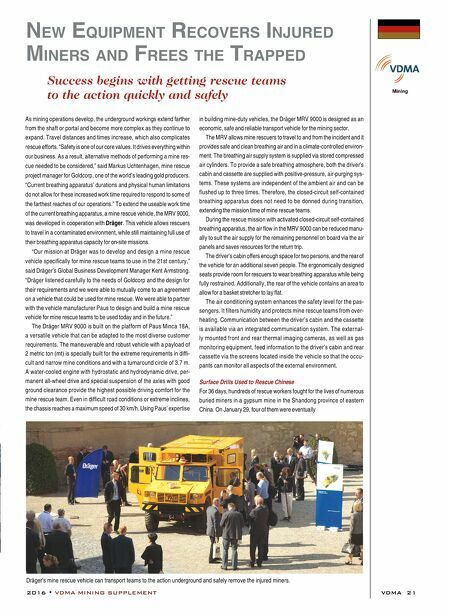 "Our mission at Dräger was to develop and design a mine rescue vehicle specifically for mine rescue teams to use in the 21st century," said Dräger's Global Business Development Manager Kent Armstrong. 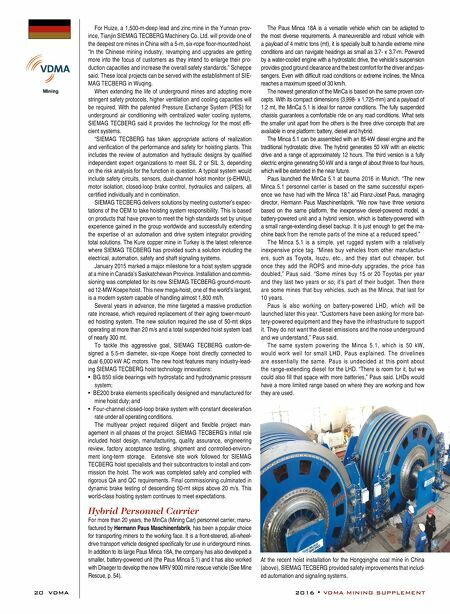 "Dräger listened carefully to the needs of Goldcorp and the design for their requirements and we were able to mutually come to an agreement on a vehicle that could be used for mine rescue. We were able to partner with the vehicle manufacturer Paus to design and build a mine rescue vehicle for mine rescue teams to be used today and in the future." The Dräger MRV 9000 is built on the platform of Paus Minca 18A, a versatile vehicle that can be adapted to the most diverse customer requirements. The maneuverable and robust vehicle with a payload of 2 metric ton (mt) is specially built for the extreme requirements in diffi- cult and narrow mine conditions and with a turnaround circle of 3.7 m. A water-cooled engine with hydrostatic and hydrodynamic drive, per- manent all-wheel drive and special suspension of the axles with good ground clearance provide the highest possible driving comfort for the mine rescue team. Even in difficult road conditions or extreme inclines, the chassis reaches a maximum speed of 30 km/h. Using Paus' expertise in building mine-duty vehicles, the Dräger MRV 9000 is designed as an economic, safe and reliable transport vehicle for the mining sector. The MRV allows mine rescuers to travel to and from the incident and it provides safe and clean breathing air and in a climate-controlled environ- ment. The breathing air supply system is supplied via stored compressed air cylinders. To provide a safe breathing atmosphere, both the driver's cabin and cassette are supplied with positive-pressure, air-purging sys- tems. These systems are independent of the ambient air and can be flushed up to three times. Therefore, the closed-circuit self-contained breathing apparatus does not need to be donned during transition, extending the mission time of mine rescue teams. During the rescue mission with activated closed-circuit self-contained breathing apparatus, the air flow in the MRV 9000 can be reduced manu- ally to suit the air supply for the remaining personnel on board via the air panels and saves resources for the return trip. The driver's cabin offers enough space for two persons, and the rear of the vehicle for an additional seven people. The ergonomically designed seats provide room for rescuers to wear breathing apparatus while being fully restrained. Additionally, the rear of the vehicle contains an area to allow for a basket stretcher to lay flat. The air conditioning system enhances the safety level for the pas- sengers. It filters humidity and protects mine rescue teams from over- heating. Communication between the driver's cabin and the cassette is available via an integrated communication system. The external- ly mounted front and rear thermal imaging cameras, as well as gas monitoring equipment, feed information to the driver's cabin and rear cassette via the screens located inside the vehicle so that the occu- pants can monitor all aspects of the external environment. Surface Drills Used to Rescue Chinese For 36 days, hundreds of rescue workers fought for the lives of numerous buried miners in a gypsum mine in the Shandong province of eastern China. On January 29, four of them were eventually n ew e qui PM en T r e C o V ers i njured Miners and Frees T he Tra PP ed Success begins with getting rescue teams to the action quickly and safely Dräger's mine rescue vehicle can transport teams to the action underground and safely remove the injured miners.